A 32-year-old female presented for Colorectal Surgery consultation regarding an 18-month history of vague left-sided abdominal pain, intermittent bloating, frequent stools, and occasional passage of mucus. Her laboratory work-up was negative. CT scan of the abdomen and pelvis revealed a “mass in the small bowel mesentery”. She had no chronic medical issues and had no prior surgeries. Physical findings included a palpable mass in the left upper abdomen with tenderness to palpation at that site. She underwent EGD and colonoscopy, both of which demonstrated an extra-luminal mass. Diagnostic laparoscopy was performed. Findings included a small amount of chylous-appearing peritoneal fluid and a lobulated mass involving the small bowel mesentery. Laparoscopic resection of the cystic mass including the short segment of jejeunum was undertaken with primary anastamosis. She had complete resolution of her symptoms. The diagnosis on final pathology was that of a mesenteric lymphangioma measuring 7 x 6 cm. Lymphangiomas are congenital malformations thought to be the result of failure of the primary lymphatic sacs to join the lymph system. These are most often seen in the pediatric population as a head, neck, or axillary mass. Less than 1% are found in the small bowel mesentery. Considering the rarity of this benign cystic tumor and the vague presenting symptoms, one must have a high index of suspicion to sort this out. Most are diagnosed after resection. 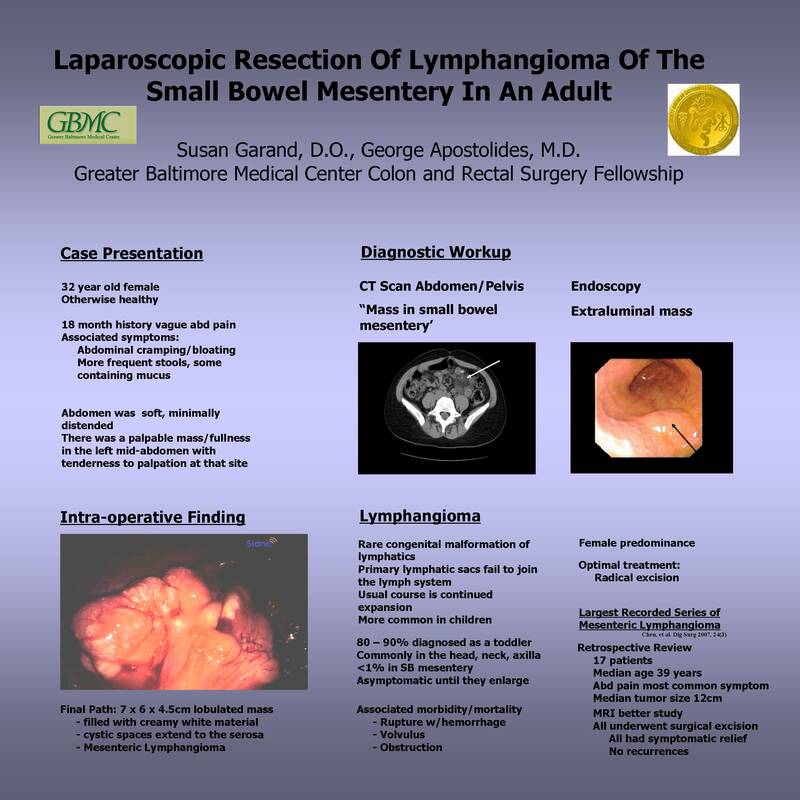 Lymphangiomas tend to enlarge and can cause significant morbidity including obstruction, volvulus, or rupture with hemorrhage and/or peritonitis. The mass can be visualized on ultrasound, CT, or MRI. Pre-operative diagnosis can be made by percutaneous aspiration of the cystic mass. Complete surgical resection is the treatment of choice. Reported recurrence rates are from 0% to 27% for complete resection and 10% to 100% for incomplete resection.